Vulcanair P68 multi-mission aircraft (MMA) is a cost-efficient surveillance aircraft. Image: courtesy of Airborne Technologies. Vulcanair P68 MMA integrates Airborne LINX system from Airborne Technologies. Image: courtesy of Airborne Technologies. The tactical work station aboard the Vulcanair P68 MMA. Image: courtesy of Airborne Technologies. The Vulcanair P68 multi-mission aircraft (MMA) is a fixed-wing surveillance aircraft equipped with Airborne LINX system developed by Airborne Technologies. 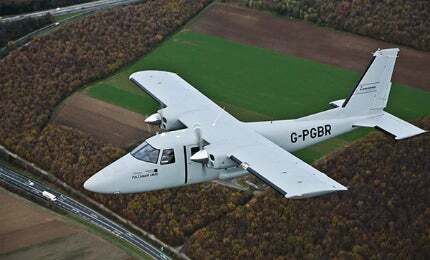 The all-weather capable aircraft is based on the P68R aircraft built by Vulcanair. P68 MMA can be deployed in observation and reconnaissance, airborne surveillance, maritime patrol, search and rescue (SAR), and homeland security missions in high-stress environments. It is cost-efficient and is believed to be a better alternative to helicopters for use in surveillance missions. Vulcanair P68 MMA was demonstrated at Paris Air Show in June 2015. Airborne Technologies received a contract from the UK National Police Air Service (NPAS) for four Vulcanair P68s in September 2015. "The all-weather capable aircraft is based on the P68R aircraft built by Vulcanair." The Vulcanair P68R incorporates a high-wing monoplane design made of corrosion-treated aluminium. The structural simplicity and aluminium construction ensure low operating costs. The under-fuselage integrates a retractable landing gear, which enables best view for the camera and crew. The aircraft has a length of 9.55m, a wing span of 12m and a height of 3.4m. It accommodates a crew of three members and can carry a sensor payload of up to 230kg. The fully glass cockpit integrates a primary flight display, a multi-function display (MFD) / engine monitoring system (EMS) from Sagem, Garmin GNS530W and GNS 430W avionics systems, a TAS600 series traffic advisory system (TAS), a GARMIN GTX 330 Mode S transponder, and GMA 347 audio panel / PAC24 mission audio panel. The avionics suite also incorporates S-Tec 55X autopilot, analogue to digital converters (ADCs), KN63 distance measuring equipment (DME), and AXI-200 attitude heading and reference system (AHRS). The Ka-226T is a light, twin-engine multi-role helicopter offered by Russian Helicopters, for military and civilian missions. The Airborne LINX command and control, intelligence, surveillance and reconnaissance (C2ISR) solution aboard the aircraft integrates Wescam MX 10 multi-sensor, a multi-spectral imaging system that can have up to six imaging and laser sensors. It is based on a standard ethernet network. C2ISR system also constitutes an augmented reality system, line of sight (LOS) data-link, a still camera for aerial photographs, tactical radios, crew communication management system, video/voice/data recorder and a mission management unit. The MMU coordinates the entire system and displays data of all onboard sensors and communication systems on a simple-to-use touchscreen integrated in a tactical workstation. A tactical work station can be equipped with up two full HD touchscreens, which allow one or two operators to operate the Airborne LINX package. The station is also equipped with a keyboard, push-to-talk pedal button, a bracket for gimbal hand-control unit, and provisions for tactical radio, moving map/augmented reality system and LOS downlink transceiver. The Vulcanair P68 is certified for flight into known icing conditions (FIKI). It is also fitted with a weather radar, as well as pre-heat and enhanced vision system for operations in any weather conditions. Active and passive safety packages aboard the aircraft encompass high-intensity strobe lighting, a combined voice/data recorder and active TCASII (traffic alert and collision avoidance system), life jackets and rafts for all crew, portable emergency locator transmitters (ELTs), and a fire extinguisher. The aircraft is fitted with two Lycoming IO-360-A1B6 engines. Each engine driving a Hartzell two-bladed constant speed, full-feathering propeller develops a maximum power of 200hp. P68 MMA can be equipped with an integrated noise reduction system, including three-bladed propellers and integrated exhaust mufflers, which make the aircraft an ideal platform for passive surveillance. The aircraft has a maximum speed of 202 knots true airspeed (KTAS) and minimum mission speed of 75 knots indicated air speed (KIAS). It can climb to an altitude of 20,000ft at a rate of 1,400ft/min and has a maximum range of 1,300nmi. The aircraft supports short take-off and landing (STOL) and rough runway operations.